The small and stunningly beautiful Himalayan kingdom of Bhutan has for many years intrigued the West, not least on account of its geographic isolation, its hermetic reputation, and its distinct and perfectly preserved culture. The core of Bhutan’s identity is its Tibetan Buddhist heritage which, uniquely in the modern world, remains as rich and vital as it ever has been. In over two thousand thriving temples and monasteries scattered across its rugged terrain, spectacular wall paintings testify to the strength of its cultural and artistic traditions. Many of these sites are remote and their paintings have never before been recorded. 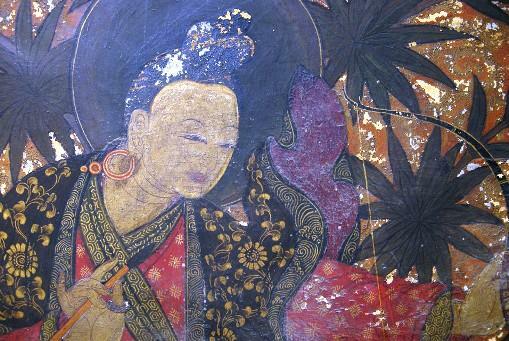 During the last three years, experts from The Courtauld Institute of Art, University of London, have been given unique access by the Government of Bhutan to undertake scientific research of the kingdom’s wall paintings. To consolidate both his temporal and religious power, the Zhabdrung also built a series of Tibetan-style fortresses, known as dzongs, at strategic locations across Bhutan. These combined administrative and monastic institutions in a system of regional governance that survives to this day. The dzongs still accommodate communities of hundreds of monks, whose religious life revolves around the many temples (lhakhangs) built within their fortified walls. Usually, each of these temples is adorned with wall painting. Today, these paintings are vulnerable to a range of threats. The traditional buildings in which they survive are often damaged – and sometimes completely destroyed – by catastrophic fires or floods. In a harsh natural environment, gradual deterioration also takes its toll on the susceptible materials that constitute the paintings. Although continuous religious use has helped to preserve many temples and monasteries, there have been detrimental consequences too: in attempts to renew religious interiors, historic paintings have suffered from modern repainting or have been replaced with paintings on canvas. he Department of Culture, within the Ministry of Home and Cultural Affairs of Bhutan, is now taking steps to address these problems. Efforts include the current three-year research project with the Courtauld Institute. Following an exploratory visit in 2006 by Professor David Park, Director of the Courtauld’s Conservation of Wall Painting Department, it was decided that there was an outstanding need to investigate the materials and techniques of Bhutanese wall paintings. An understanding of how the paintings were made leads to an understanding of how they deteriorate and, ultimately, how they can be best preserved. The main purpose of the research is therefore to benefit the Department of Culture in undertaking any conservation of wall paintings in future. The fieldwork has been carried out by wall painting conservators Lisa Shekede and Stephen Rickerby of the Courtauld Institute, in collaboration with staff from the Department of Culture of Bhutan. The first major phase took place in 2008, and two subsequent phases were completed in 2009 and 2010. Scores of temples and other religious sites were visited throughout the kingdom, to record their paintings and to collect small paint samples for subsequent analysis in London. This is the first time such a wide-ranging scientific study of painting has been undertaken in Bhutan, and findings have proved to be exciting. Previously scant knowledge of the original materials and techniques of Bhutanese wall painting, and of their historical and stylistic development, has been much enhanced. Although relatively few paintings survive from before the 17th century, the study included unprecedented investigation and analysis of a rare early 16th-century scheme in central Bhutan. Other important paintings examined are those that survive from the period when the Zhabdrung and his successors established their control over the country. Under their patronage, a courtly style of painting emerged, characterized by its remarkable sophistication. In these paintings, expensive pigments, delicate organic colourants and glazes, and skillfully applied discriminating coatings have been found. This technical complexity has not been previously recognized and it puts many Bhutanese wall paintings at a variety of new risks. The vulnerability of barely visible materials such as deteriorated organic glazes means that they can be all too easily lost in cleaning if their presence is not recognized. The degradation of original materials, such as the discolouration of original varnishes, can also be mistaken as something that should be removed rather than preserved. With ever-growing Western interest in Tibetan Buddhism – and the resources that this attracts – an alarming number of Buddhist wall paintings in India and Tibet have been irreversibly damaged by well-meaning but disastrous cleaning. Bhutan’s isolationist past protected its cultural heritage from such dangers, but the opening up of the country in recent years means that such risks cannot now be ignored. The Courtauld’s research project is therefore a timely one and its findings have far reaching conservation implications. It is intended that the wealth of technical and other information to have emerged from the study will be used as a foundation for future conservation efforts, based on recognition of the value and vulnerability of the kingdom’s remarkable wall painting heritage.